During the thousand years of artistic activity at Mogao, the style of the wall paintings and sculptures changed, in part a reflection of the influences that reached it along the Silk Road. The early caves show greater Indian and Western influence, while during the Tang dynasty (618-906) the influence of the latest Chinese painting styles of the imperial court is evident. 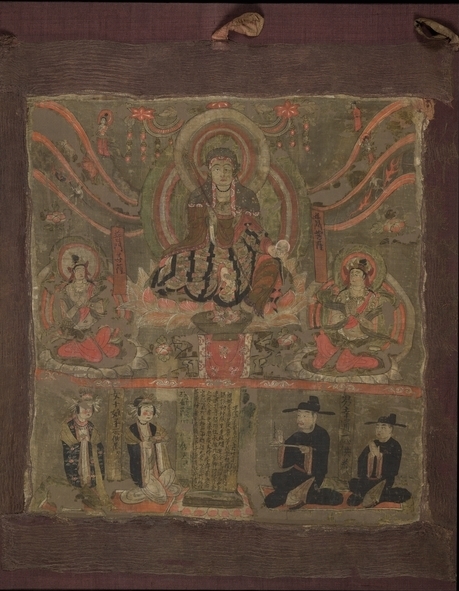 During the tenth century, Dunhuang became more isolated and the organization of a local painting academy led to mass production of paintings with a unique style. The art also reflects the changes in religious belief and ritual at the pilgrim site. In the early caves, jataka stories (about Buddha’s previous incarnations) were commonly depicted. During the Tang dynasty, Pure Land Buddhism became very popular. This promoted the Buddha Amitabha, who helped the believer achieve rebirth in his Western Paradise, where even sinners are permitted, sitting within closed lotus buds listening to the heavenly sounds and the sermon of the Buddha, thereby purifying themselves. In this Pure Land, or Paradise painting, Shakyamuni, the historical Buddha, with his hands in the vitarka-mudra (gesture of preaching), sits between two bodhisattvas. A dancer and an orchestra perform before him. Another group sits below them. The Buddha has the sun and the moon on his robes, the cosmological emblems of Mount Shumeru. The scene is probably intended to represent Shakyamuni’s cosmic aspect as expounded in the Lotus Sutra. Two mythical creatures standing on golden islands, the double-headed jiva-jiva and the kalavinka, flank this second group. A row of donors are shown at the base of the painting. 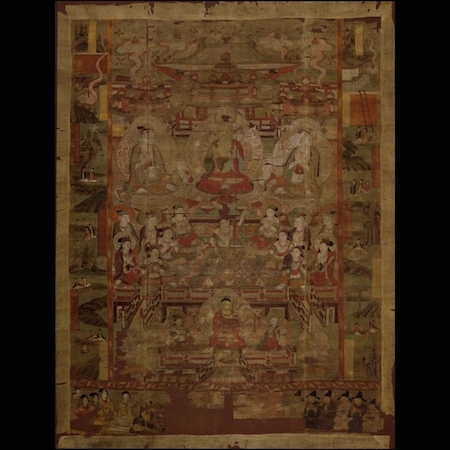 Along both sides of the painting a sequence of episodes tells the story of Prince Siddhartha from the Baoen-jing, the ‘Sutra of Requiting Blessings Received’. This is a jataka about Shakyamuni’s previous incarnation. Prince Siddhartha and his parents flee their palace upon hearing the murderous intent of a treacherous minister. When their provisions run out, Siddhartha offers his own flesh to his parents. After his parents have each taken a piece, Siddhartha is left by the roadside. A hungry lion appears, and the prince offers his final piece of flesh to the creature. The lion turns out to be the god Indra, who restores him to strength and wholeness. Various Paradise paintings decorate the walls of the cave temples of this period, each representing the realm of a different Buddha. Their Paradises were shown in sumptuous Chinese palace settings. Simplified versions of these buildings appear on banners depicting bodhisattvas showing donors on their way to Paradise. The decoration of each cave-temple was usually commissioned by an individual (whether an official, monk, governor or merchant, for example) and dedicated to their families and deceased relatives. However, some were commissioned by groups of lay individuals, or a religious society. The responsibility for the cave’s upkeep was often passed on to the patron’s descendants, and it could stay in the same family for generations. The caves were excavated by a team of workmen, who chizelled out the ceiling and walls, which were then plastered with clay tempered with chopped straw and finished with a thin layer of plaster. The paintings would have already been commissioned, and were executed by skilled workmen under the direction of a senior Buddhist monk. Sculptures made of stucco around a wooden armature were also an integral part of the decoration. Patrons and their portraits played an increasingly important part as time passed. At first they were depicted as much smaller than the main figures in the composition and in a subordinate position to the side. However, they gradually increased in size, until by the tenth century they occupied a large proportion of the lowest register of the paintings. In some paintings they are shown as part of the main composition and in the same scale as the holy figures in the paintings. 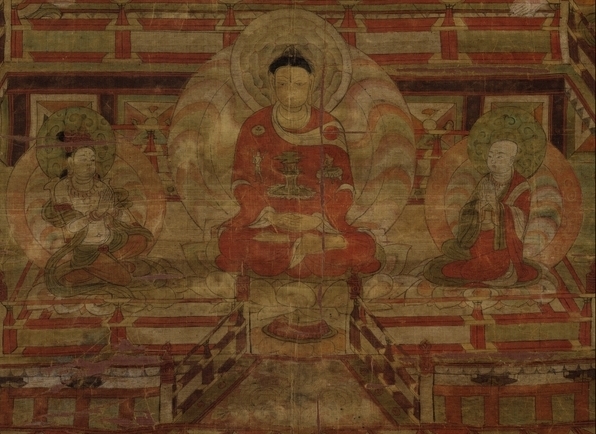 The bodhisattva Kshitigarbha in the painting above is shown wearing a hood and seated on a lotus behind an altar accompanied by two worshipping bodhisattvas. On the three lines on each side of his halo are depicted “The Six Ways of Life”: gods, animals and hell (top left) and humans, ashuras (mythical four-armed figures) and hungry ghosts (right). In the lower section of the painting are donor figures, wearing fashionable clothes, the women with typical tenth-century hair styles decorated with hairpins and flowers. According to the inscription, the donor wished to avoid all bad forms of rebirth: “The maker of this painting was the disciple of pure faith, Kang Qingnu. His body lodges in the House of Fire and he fears to fall in the Five Evil Ways. Fortune and disaster are inconstant; his heart longs to be among the emancipated…”. Kshitigarbha is depicted and invoked here as he had vowed to rescue souls even from the regions of hell, and this offers hope to the donor and his family. R. Whitfield, Art of Central Asia: Paintings from Dunhuang, vol. 2 (Tokyo, Kodansha International Ltd., 1982-85). R. Whitfield and A. Farrer, Caves of the thousand Buddhas (London, The British Museum Press, 1990). Cite this page as: The British Museum, "The paintings and manuscripts from cave 17 at Mogao (2 of 2)," in Smarthistory, March 3, 2017, accessed April 23, 2019, https://smarthistory.org/the-paintings-and-manuscripts-from-cave-17-at-mogao-2-of-2/.